Marucci’s 2017 CAT 7 is, without argument, one of the best bats on the market. It runs in a number of sizes, has considerable upgrades from the Marucci CAT 6 and comes in at a more palatable price point than other maruqee bats. Marucci releases their bats on a 2-year cycle. Meaning, there is no official 2018 CAT 7. 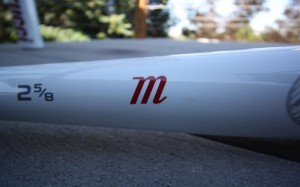 However, we did write a 2018 Marucci CAT 7 review as to highlight some new paint jobs on the bat and recap what we learned over the last year. Below is our original 2017 Marucci CAT 7 review. We played 12 games with the 2017 Marucci CAT 7 at players’ disposal, and many took us up on the proposal to take the new bat to the plate. We also spent at least 3 hours in the cage hitting with the BBCOR, drop 8 and drop 5 to come up with our 2017 Marucci CAT 7 Review. In early May, 2017, Marucci released a limited edition of the CAT 7.It is the same bat but with updated graphics. It comes in a drop 5, drop 10 and BBCOR. We also spent time the drop 5 version of that limited edition in the cage. This article fits under our 2017 Baseball Bat Reviews page. The CAT 7 sits proudly atop our best drop 5 baseball bats page. As well, it receives some honorable mentions, and so does the CAT 6, in our best baseball bat arena. In other words, although the CAT 7 may not be the right bat for everyone, for the people it is the right bat for the thing is an absolute ball killer. In the drop 8 space, now that the DeMarini 2 5/8 Zen was made illegal by USSSA, the CAT 7 is one of our favorites. Generally speaking, those looking for a mid price range performance bat, prefer an aluminum barrel, want a true balanced swing weight and can appreciate the feel of a single piece stick should seriously consider the 2017 Marucci CAT 7. Others who prefer composite, want an ultra light swing weight, would rather have an oversized barrel and/or prefer two piece bats should keep on looking. The best CAT 7 price we found was here: Amazon. On the whole, we surmise the bat belongs with those who prefer the stiff power of a one piece aluminum bat and its accompanying wood like experience, but also want a light swinging stick—which is a combination often impossible to find. The bat also boasts sting dampening on mishits (more on this later) and we’ve found, like the CAT 6 before it, this is a legitimate claim. In essence, the CAT 7 swings like a light swinging two piece composite but keeps the integrity of a wood bat feel. The ping is clean and loud and the look immaculate. Durability should be outstanding. The expanded sweet spot over the CAT 6, made possible by some inner barrel tapering, is noticeable and appreciated. No other bat on the market has the sting dampening mechanism found in the knob like the Marucci CAT 7. (That’s because Marucci owns the patent). So, if the lack of that feature is a deal breaker, your decision appears made. Are built for the hitter who likes a light swing. Although unique in its own right, the 2016 Axe Hyperwhip is also similar in the sense of a single piece aluminum with a tapered wall and a light swing weight. That bat, however, has an asymmetric knob and end cap. Other bats in the light swinging class are of composite construction and those left in the single piece aluminum space are at best mid range swing weight (MOI) bats. Like previous years’ models, the 2017 CAT 7 will come in a variety of sizes for a number of different hitters. BBCOR, Senior League (2 5/8) in a drop 8 and drop 5 as well as a Junior Big Barrel drop 10. There is a special limited edition CAT 7 released too. This bat has a black base color with gold accents. It is flat out beautiful. That bat will come in a drop 8, drop 5 and BBCOR version. They are very limited in quantity so good luck finding one! 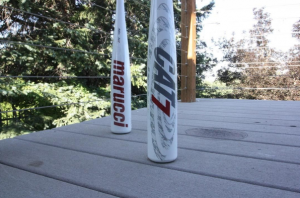 The CAT 7 does not come in a traditional Drop 10 in the Big Barrel or Senior League space. Nor will it be released, at least as of this writing, in a youth (2 1/4) barreled size. Compared to the 2016 CAT 6 there are a few notable changes. On the top of the list is the expanded usable sweet spot on the CAT 7 made possible by a new tapered barrel design. To be clear, the inside of the barrel is tapered to allow for more pop (flexibility) outside the center of the barrel. The idea isn’t new in the industry but it is new for Marucci who claims the design feature expands the sweet spot by double. It would be impossible for us confirm that metric, but we can confirm the sweet spot is bigger. This larger sweet spot when compared to the CAT 6 makes the CAT 7 a very worthy upgrade. 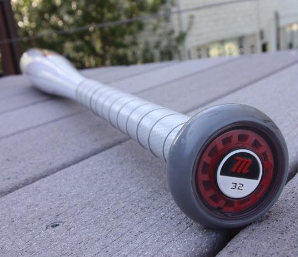 Additionally, Marucci claims to have retooled and improved the anti-vibration feature of the bat in the knob. From the outside looking in, although painted red, the piece looks similar. Any claimed improvement is only good news. We love this feature since the CAT 5 Squared some 6 years ago. How much improved we won’t be able to tell, but we know the new knob, like the old one, works. The anti-vibration insert in the knob addresses the age old ‘numb thumb’ problem for which single piece aluminum bats are infamous. That is, the vibration created from a mishit on a traditional single piece aluminum bat actually travels unimpeded from your barrel directly into your hands and then up your arms to your mouth where curse words are forced to form. It’s true. We’ve verified that many times. The anti-vibration feature in the CAT 7 addresses this. It is a piece of composite rubber that sits inside the bottom the handle and knob and helps absorb much of that vibration so as not to reverberate all the way to your mouth. Other companies have addressed this problem by creating two piece bats with sting dampeners built within the transition. But, the argument goes, two piece bats disregard the value a real hitter gains from a bat with accurate feel and stiffness to the ball. Marucci would claim the CAT 7 and its predecessors keep the integrity of the swing while diminishing the vibrating consequences. Their argument is legit. Like the CAT 6, the CAT 7 uses the same tacky and cushy grey grip, and from a color standpoint, not much has changed but some highlights here and there. The end cap is the same. If you don’t live where there are hurricanes, the CAT name may not ring a bell. Those who do, will recognize the CAT is in reference to hurricane categorizations. A Category 5 hurricane, for example, is the highest rated, most damaging hurricane. Winds are rated at more than 200mph. A CAT 7 is reserved only for the movies. Or, in this case, the ball field. We’ve been big fans of Marucci’s commitment to smooth feeling sticks with massive power ever since we picked up the CAT 5 Squared from an eBay auction about 6 years ago. The anti-vibration knob does a remarkable job keeping sting off the hands—although maybe not as good a job as some two-piece bats, but it’s enough to be noticeable. The CAT series has recreated a wood bat’s power transfer and swinging experience as well, if not better, than any bat on the market. This year’s addition of a larger sweet spot and the hybrid will be well received.